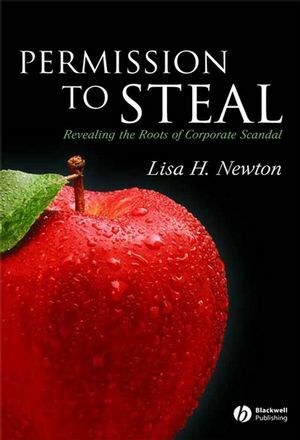 Citing recent examples including Enron, Arthur Andersen, and WorldCom, Permission to Steal explores what went wrong and advocates a universal reassessment of what is considered “good” in corporate America. A fascinating exploration of the recent corporate scandals which have rocked the global business community. Written with sharp and compelling style, suitable for students, professionals, and general readers. Companion website offers discussion points for the book as well as an up-to-date chronology of ongoing corporate scandals. Lisa H. Newton is Professor of Philosophy and Director of the Program in Applied Ethics at Fairfield University. She is the author of numerous articles and books in business ethics, and most recently published Business Ethics and the Natural Environment (Blackwell, 2004). Choosing a Path in the Woods. 1. The World, the Flesh, and the Devil. A Look in the Mirror is Not Reassuring. An Ancient Fable Says It All. How Bad Can It Get? The Unspeakable Crimes of the Very Good. 2. The Lethal Marriage of Ideology and Opportunity. Free Market Liberalism and Village Conservatism. The Origins of the Moral Human. The Collapse of Every Restriction. Regaining the Duty of Stewardship. "Permission to Steal is hard-hitting, insightful, passionate, and refreshingly readable. It is a must-read for all citizens who care about ethics in business and a more healthy society." "This book blends the insight of a first-rate philosopher with the moral outrage that every citizen should feel about the wave of recent corporate scandals. Newton minces no words in addressing the fundamental questions that every person should ask: What went wrong? Why was it wrong? How did it happen?" "Permission to Steal reads like a whodunit: once you start reading it, you will find it difficult to put down. A crisp outlining of corporate scandals moves seamlessly to an analysis of their causes. Newton concludes with seven tasks to bring our society to a point where we can ‘trust our nation’s wealthiest not to rob us.’ Bravo to the author: all will learn from her in this delightful read." Advocates a universal reassessment of what is considered "good" in the corporate world so that we won't again fall victim to corporate thieves. Uses recent examples of corporate scandal including Enron, Arthur Anderson, WorldCom, and others.